Benjamins welcomes to the market a fantastic opportunity to obtain a two bedroom detached property offering immense potential, ideal for anyone looking for a small project & great investment. 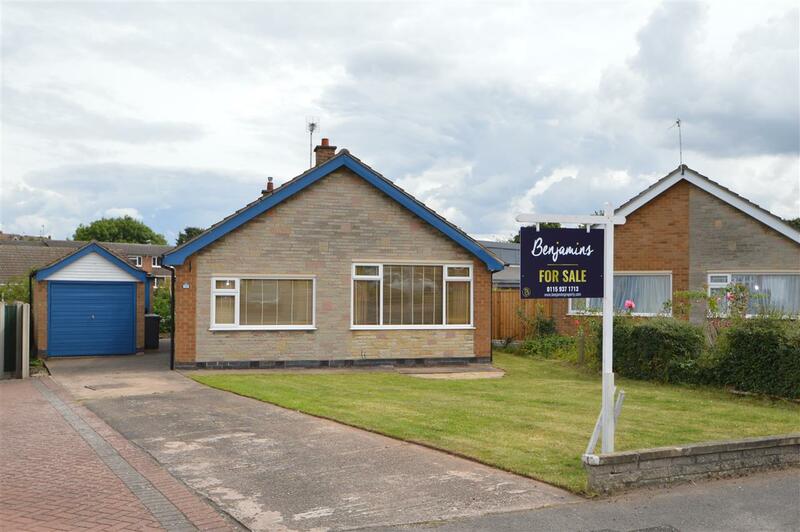 Benjamins are pleased to present for sale this two bedroom detached bungalow, in the much sought after village location of Keyworth, with simple access to the local shops. The property briefly comprises; Entrance Hall, Living Room & Kitchen to the rear. There are two double bedrooms and shower room, with Separate Toilet. Additionally, the property also includes a paved Driveway, Garage and Brick conservatory to the private rear garden. Desirable through pedestrian access to Budgens Supermarket and The Wolds Parade shops to the rear of the property. To really appreciate the potential of this property, a viewing is a must. The property is undergoing a small re-decoration (completion week ending 31/07/2016) Property description & Room dimensions available after this date. Positioned at the front of the property includes the living area with power, lighting, gas fire place with stone surround, radiator and double glazed window to the front aspect. The kitchen has a range of upper and lower units with rolled edge work surfaces, electric oven and hob, stainless steel sink and drainer with mixer taps, power, lighting, tiled walls and flooring, space for washing machine, space for fridge/freezer, space for table and chairs, boiler, double glazed window and Upvc double glazed door leading the Conservatory. A double bedroom includes fitted wardrobes and dressing table, power, carpet and double glazed window to the rear aspect. A double bedroom includes storage cupboard, power, carpet, and a double glazed window to the front aspect. Two piece shower suite with easy access walk in shower cubical, pedestal basin, tiled walls and flooring, radiator, and frosted window to the side aspect. Separate WC positioned next to the shower room, lighting and radiator. A very good sized conservatory/ Sunroom leading from the kitchen with power, double glazed windows surround and double glazed door(s) giving access to the rear. To the rear of the property is a good size family garden with fence panels, an a large patio area and laid lawn. Access through to local amenities and public transport. To the front of the property, large drive for car parking, laid lawn, shrubs and detached garage.